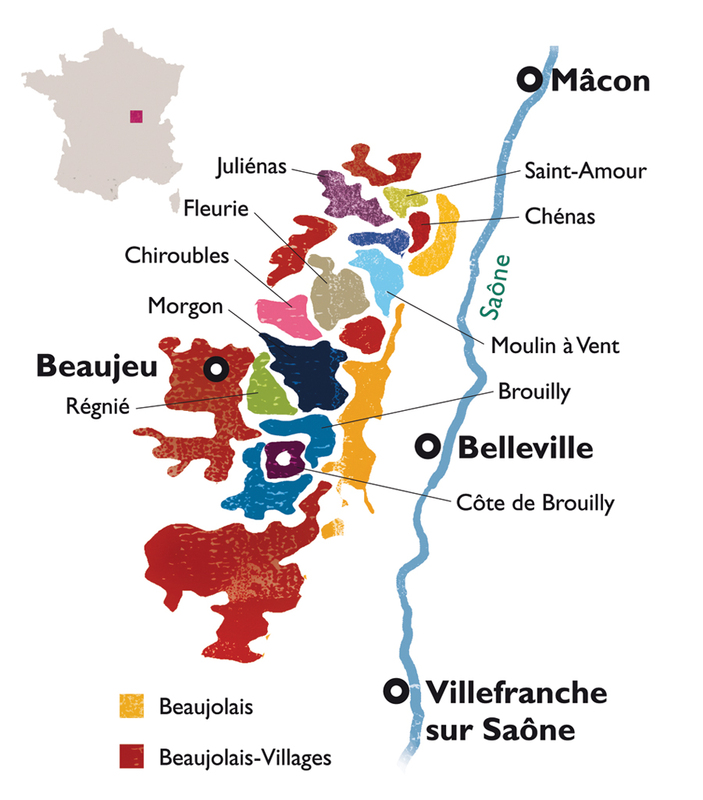 #NWTW Week 11: Where Is Beaujolais? I always find that as much as you’ve heard of places, and you drink the wine from there, it always helps to have a picture in your head of exactly where it is in the world. So where’s Beaujolais? You’re not getting any points if you just said France! It is in France, but I stuck a bloody great French flag on my first post this week, so stop cheating. Beaujolais is on the way over to the east of France, starting to the south of where Burgundy finishes. It’s sometimes rather flippantly thrown in as part of Burgundy, but it’s plenty different so we’re not doing it here. It’s got beautiful rolling hills and perfect weather conditions for growing Gamay. This is the grape that’s grown up and down its length. The wines are split into 3 different ranks. I’m going to stick AC on the end of the names here, which means appellation contrôlée. It’s the French system of regulation for wines that we’ve spoken about when talking about Burgundy and Bordeaux in the past. Firstly you’ve got normal Beaujolais AC. This is just any wine made from Gamay in the region. Secondly you’ve got Beaujolais Villages AC, the slightly better areas for growing, where the hills are that little bit more rolling I guess. Thirdly, you’ve got a list of nearly 40 villages that can pop their names on the bottle as a Beaujolais Cru. Again, the chances are that these wines will be the next step up in terms of quality, and will also have a slightly more distinctive taste. Well I guess I’ll find out this week as I’ve picked my 4 wines from 4 different crus – Juliénas AC, Fleurie AC, Saint-Amour AC, and Brouilly AC. You can see more on the map up top there. Hopefully that’ll help you understand the labels a bit more! Pingback: Please Bring Me My Wine | #NWTW Week 11: What’s Your Beaujolais Going To Taste Like? Pingback: Please Bring Me My Wine | #NWTW Week 11: What Am I Going To Eat With My Beaujolais?